As one of the most successful IVF centers in the United States, Conceptions Reproductive Associates of Colorado needed an online marketing program that properly leveraged the caliber of their scientific, medical and patient care teams. Their previous website was based on Microsoft Sharepoint making modern web practices like adaptive design, difficult to implement. 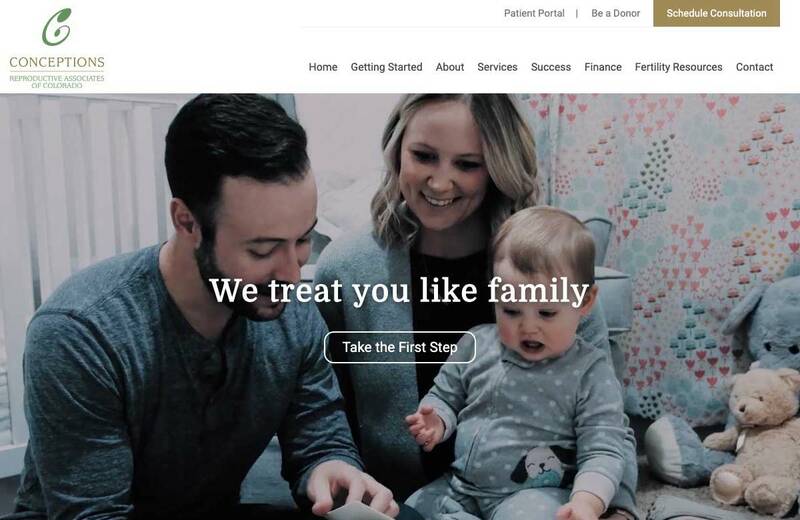 TD Media worked with Conceptions to identify the competitive advantages of their practice and then built an adaptive website around those key differentiating factors including the newly branded Conceptions CSS IVF Program which includes complete chomosomal screening and frozen embryo transfer. To help educate patients, TD Media suggested including information explaining why frozen embryo transfer often produces better live birth rates. TD Media's insight into the mind of prospective IVF patients was key to developing an effective marketing strategy for Conceptions. TD Media continues to provide ongoing, monthly marketing services including website maintenance, performance monitoring and analysis for Conceptions and will be working to launch the Conceptions Egg Bank in 2016. Protect your practice by obeying the rules of HIPAA compliance on your website and email correspondence. Have a medical disclaimer and a privacy notice available on your website. Inquiry forms should run on a secure server, so that patient information is protected. Want more free marketing advice? You don't want to waste any more time and get started! Fill out a short form and receive a proposal.